The most advanced, most comprehensive Bluetooth protocol analyzer ever made. Building on a legacy of innovation, the Bluetooth Vanguard All-In-One Protocol Analysis System delivers new advances designed to ease the increasingly complex tasks of Bluetooth developers. 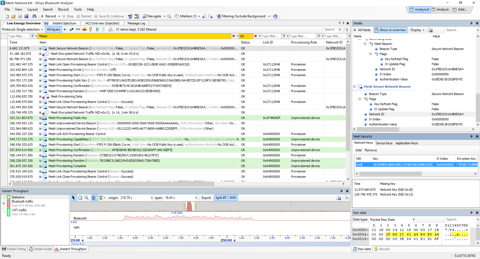 Vanguard provides synchronized capture and analysis of BR/EDR, Bluetooth Low Energy, Wi-Fi 802.11 a/b/g/n/ac (3x3), WPAN 802.15.4 (all 16 2.4 GHz channels), raw 2.4 GHz RF spectrum analysis, HCI (USB, UART, SPI), generic SPI/UART/I2C/SWD communications, WCI-2, logic signals, and Audio I2S. With its revolutionary whole-band Digital Radio and integrated All-in-One hardware approach, Ellisys engineers changed the way Bluetooth protocol capture and analysis is done, by radically overcoming the drawbacks of legacy approaches such as hopping analyzers that limit and obscure important traffic or modular approaches that can be cumbersome to set up or even contribute to imprecise measurements. 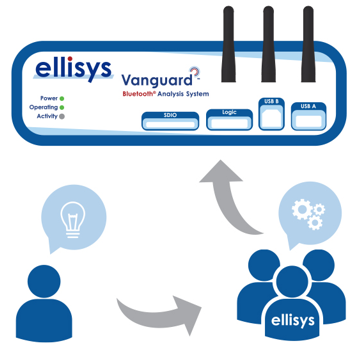 Ellisys innovations have set the foundation for many more unique and powerful enhancements to our Bluetooth products, including several such features now available on the Bluetooth Vanguard, easily the most advanced Bluetooth analyzer ever made. We believe in working closely with our customers to understand their challenges and implement new products and features to meet these challenges. The reconfigurable radio concept for Bluetooth analyzers is another innovation from Ellisys engineering. With the Bluetooth Vanguard, this cost-saving feature remains a core user benefit. Reconfigurability means that the analyzer can be updated by software to support new features, without any change to the hardware. For instance, this flexibility allowed for the addition of next-generation Bluetooth features such as enhanced AES security, Connectionless Broadcast, and recent features, like Coded PHY and the 2Mbps BLE speed enhancement, many months before these features were released in an updated specification. Additionally, Ellisys analyzers come with free lifetime software updates and no restrictions on sharing the application software with co-workers, so our customers can benefit from these great additions hassle-free. This concept has greatly improved and accelerated the overall development cycle for Bluetooth technology. With legacy solutions, Bluetooth engineers had to test new features with old analyzers that employed prior-generation radios, effectively an impossible task. With the Ellisys reconfigurable Bluetooth digital radio, support for new features are available at a very early stage, well before specifications are released. This approach helps Bluetooth radio development teams ensure proper operational characteristics well before the specification is final, and well before final spins. This dramatically improves the quality and interoperability of Bluetooth products employing new features and speeds the development cycle. With Vanguard, Ellisys engineers have introduced yet another disruptive industry first – Bluetooth capture diversity. This technique involves a co-operational replication of a whole-band capture engine, an Ellisys innovation introduced on its prior Bluetooth analyzers. Additionally, Both antennas can be angularly displaced on the analyzer unit, externally cabled and placed at optimal locations by the user to improve the spatial volume of the reception, or placed nearer specific devices under test to reduce packet error rate. Bluetooth packets can be degraded and missed by both Bluetooth test equipment and Bluetooth devices due to antenna positioning, signal strength issues, or RF interferences such as Wi-Fi and a variety of consumer electronics operating in the same band as Bluetooth. Certain packet exchanges are critical to Bluetooth connections, encryption processes, and applications, and if missed can cause serious issues with communications between devices or characterizations provided by test and analysis equipment. Smart software algorithms developed by Ellisys engineers are applied to the dual capture channels, and when combined with spatial and angular flexibilities provided by this technique, can significantly improve the capture process and result in reductions in received packet error rates. With Vanguard, Wi-Fi is captured using an innovative, Ellisys-designed hardware-accelerated protocol engine. 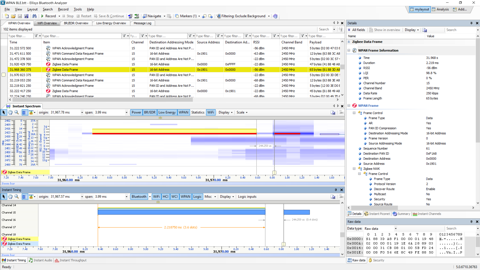 With lower-performance Wi-Fi capture tools that use a software-based capture approach, such as that which can be done with just about any computer, the capture process is done with a processor involved. This approach can limit the speed and timing accuracy of the capture – packets can be missed when the processor is outmatched by the incoming streams. With Vanguard’s specially designed protocol engine, the capture is driven directly and without processor dependence to guarantee throughput and minimize latency. 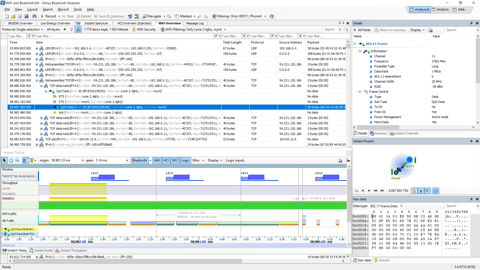 IEEE 802.15.4 is a technical standard that provides the lower-layer support of higher protocols network specifications like Thread, Zigbee, 6LoWPAN and RF4CE. Increasingly, this Low-Rate Wireless Personal Area Network (LR-WPAN) technology is being used on devices, modules, and SoC’s that also employ Bluetooth and/or Wi-Fi. The Bluetooth Vanguard captures all 16 WPAN channels used in the 2.4GHz band, including associated RF characteristics, all in precise synchronization with all other traffic streams captured by the analyzer. Wi-Fi and WPAN are common sources of interference with Bluetooth communications, as much of the spectrum used by these standards is the same as that used by Bluetooth. To properly characterize these contentions, Vanguard provides capture of Wi-Fi 802.11a/b/g/n/AC 3x3 and WPAN in precise synchronization with all other supported wired and wireless transmissions. Understanding interference sources and related hardware and stack behaviors, how Bluetooth devices attempt to avoid these interferences, and the negative effects these interferences have on Bluetooth performance and interoperability is an important task for many Bluetooth engineers. Additionally, Wi-Fi, WPAN and Bluetooth are often co-resident on a single chip, and this design approach presents substantial test and operational challenges. Vanguard has a variety of innovative features designed to enable engineers to manage these challenges. 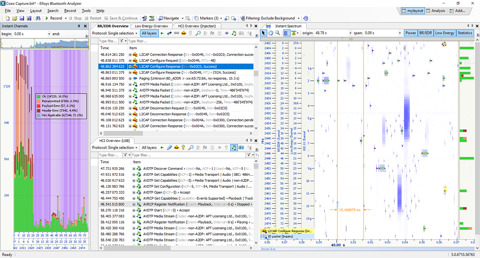 Understanding the timings of Wi-Fi transmissions, the timing of these transmissions relative to Bluetooth packets or wired interfaces such as HCI or discrete logic inputs, the power levels of these transmissions, and packet details, is quite important to the general task of ensuring proper radio coexistence. The Bluetooth Mesh Networking specifications define a broad spectrum of device and systemic requirements for a large-scale many-to-many network using Bluetooth Low Energy wireless technology. Bluetooth mesh networks can greatly increase the range of Bluetooth communications by using a message relay approach and are inherently uncomplicated and inexpensive to deploy, as there are no requirements for a central router or computer. The Bluetooth Vanguard provides support for capture, decode, and decryption of Mesh features, including a variety of mesh-specific security mechanisms and protocols. 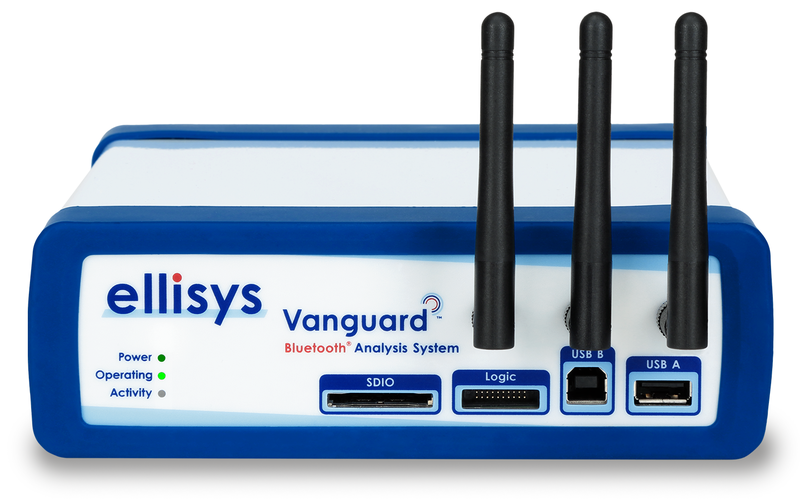 The reconfigurable Bluetooth analyzer is an Ellisys innovation. All Ellisys Bluetooth analyzer systems are reconfigurable with software updates. Ellisys maintains close relationships with radio developers worldwide and with the various technical groups involved in outlining new Bluetooth features and specifications. This approach allows new features to be added even in the conceptual stages, long before such features become standardized in a public release of the Bluetooth specification. This is a huge advantage to Bluetooth radio developers, and to the Bluetooth developer ecosystem in general, as radio developers can test new features well before they are committed to silicon, greatly reducing chances of re-spins or discoveries of issues in the marketplace, post-spin. This also raises the quality aspects of general Bluetooth radio development, effectively bringing a better product to integrator companies, and in the end, better products to consumers. Vanguard conveniently provides multiple choices to the user for system control and power. Conveniently, the user can control and power Vanguard using networkable Gigabit Ethernet (1GbE) which utilizes Power over Ethernet (PoE), or USB Type-C™, which utilizes Superspeed USB 3.1 Gen 1 (5Gbps) and USB Power Delivery. As needed, the user may also operate and power the system using an external DC supply (provided). Ellisys sponsors and participates in periodic Bluetooth Unplugfest (UPF) events, and as such, provides equipment and expertise at every event to ensure participants have the right tools at the right time. UPFs are also a good opportunity for Bluetooth SIG members to see the Bluetooth Vanguard and our other industry-leading analyzer and tester products in action. If you are attending, feel free to register to attend our one-to-one training sessions or our evening training session.